Lock in a great price for Hotel Kronprinz – rated 8.9 by recent guests! Friendly staff, close to (opposit) the railway and bus station. Town center, with parking, plenty of shops and some restaurants, is at a couple of minutes walking. Easy acces to the city of Koln by train. Close to A3 highway and A59 motorway. Room 207 - spacious, quiet and clean. Great breakfast, friendly staff. Trying hard to find something I didn't like ... Next door is an Irish Pub and if you walk another 7-8 step you're at a Restaurant with outstanding service and food quality! Very unique and classic building, but with new modern touches that make the rooms comfortable and enjoyable. 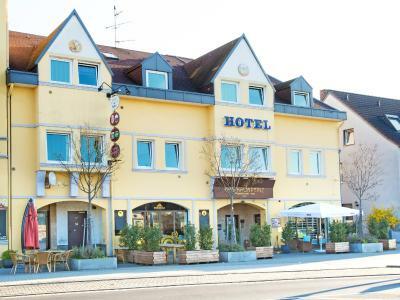 This hotel is located in Troisdorf town center, opposite Troisdorf Train Station. Hotel Kronprinz offers rooms with free Wi-Fi and cable TV. Hotel Kronprinz is an elegant hotel dating from 1901. It is located in Troisdorf’s main shopping street and is a 5-minute walk from parks and woods. A buffet breakfast is provided each morning in the Kronprinz’s large breakfast room. Cologne/Bonn Airport is 8 minutes from Kronprinz Hotel by train. Frankfurt Airport and Düsseldorf Airport are less than a 60-minute train journey away. 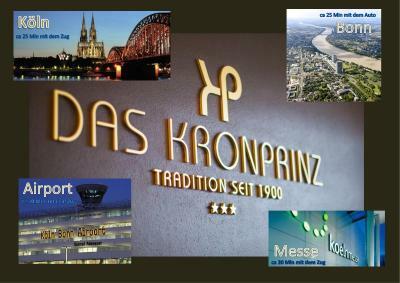 Hotel Kronprinz offers quick access to the A3 and A59 motorways. This property also has one of the top-rated locations in Troisdorf! Guests are happier about it compared to other properties in the area. This property is also rated for the best value in Troisdorf! Guests are getting more for their money when compared to other properties in this city. Elegantly decorated, soundproofed room features a flat-screen TV and a private bathroom. Please note that reception is open from 06:30 until 23:00 from Mondays till Fridays and from 07:00 until 19:00 at weekends or on public holidays. If you will be arriving later than these times, you must contact the property in advance to get information on how to check in using the key safe. Please inform Hotel Kronprinz of your expected arrival time in advance. You can use the Special Requests box when booking, or contact the property directly using the contact details in your confirmation. The bathroom was tiny, and the shower door is a challenge to rounder people like myself. The cut-up fruit at the breakfast buffet had been out for too long and tasted a bit off. The bathroom fan was a bit noisy. Parking at €6/night at a municipal carpark. The proximity to the railways and the busy bus station can be noisy. Trains (goods and passengers) operate 24/7 at this track to and from Koln. The windows do block 99% of the noise, when they are closed. Great location with the train station closed by. Excellent customer service with helpful and friendly staffs. We had to travel to airport early morning and missed the breakfast session. The staffs were very helpful providing us with packed lunch box to takeaway to the airport. No AC in our room and public area. Can be hot but we had a huge window that we can open for air (like a door). Included breakfast was sooo yummy and they went above and beyound wjth a smootie and juice bar with variety : raspberry smootie, strawberry smootie, mango smootie, pear juice, cherry juice, pineapple juice, apple juice, orange juice, vitamin juice, gaz water, lemon water, latte, cappucino etc! Very friendly room, well presented, a lot of different choices for all taste. Very friendly staff like a family. Mineral water at front desk. Fridge with options of beers, waters and soda at the frontdesk for little supplement (about 2 dollars each). Clean with white sheets and cover. I like to have a cover for each person (single size). Very appreciated welcome gift (mineral water in a glass bottle and gummy bears). A few minutes walking from the train station to go to Cologne, grocery stores (Kaufland, Aldi), restaurants, drug stores (Müller), movie theater etc. In front of the bus terminal. Quiet and privacy. Try to get a room to the back side to have less noise from the nearby train station. Amazing ambience and non-standard rooms, since it's build into this old building. Really friendly staff and excellent service (try the Lunch Package for your travels!). And the WiFi is surprisingly fast for German standards. The breakfast menu is really good and even there the staff tries to fullfill your wishes. For everything else there are good restaurants nearby. Also Cologne & Bonn are just a quick train ride (or boat tour) away, same like numerous hiking places (Wahner Heide, Siebengebirge, ...).